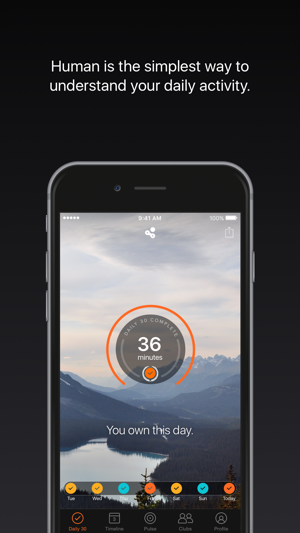 At Human, we believe the best way to improve your daily activity is by understanding it. So everything we do is designed to help you learn, improve upon, and feel good about your activity levels. Most fitness apps count your steps, rather than the minutes you move. When you’re on your way to meet a friend you say, “See you in 20 minutes” not “See you in 20 steps.” Why should your favorite tracker be any different? With Human, we built an app that speaks your language. 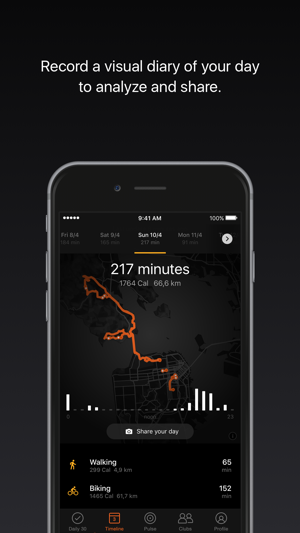 Automatically track your walks, runs, and bike rides as you move throughout your day. 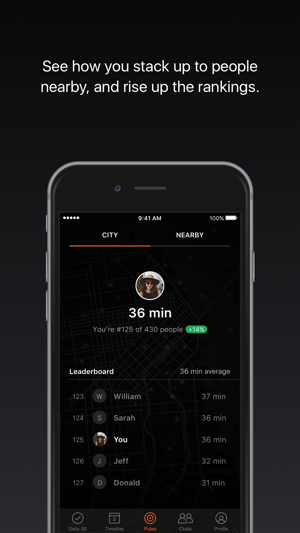 Human helps you answer the question, “Am I doing enough?” With Pulse, get a sense for how much your city moves and compare your activity levels to people like you. 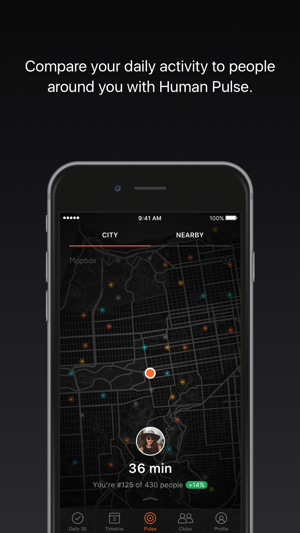 See how you stack up to people nearby, and rise up the rankings that are most relevant to you. 30 minutes of daily activity are the best form of preventive medicine. Every minute you spend walking, running or biking throughout the day counts towards your goal on Human. It's never been this easy to stay motivated along the way, every day. Sync your walking, running and cycling activities to iOS Health to get a complete overview and use your activity data with other apps. Tracking your day on an iPhone 5S, 6, 6S or 6SE? 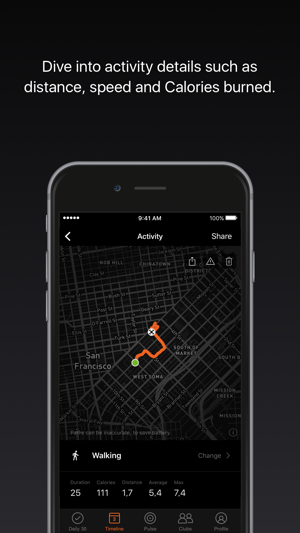 Make sure to enable "Fitness Tracking" in iOS Settings / Privacy to track your activity. Continued use of location services running in the background can dramatically decrease battery life. Human is optimized to use minimal power and minimize the impact on your battery life. In most cases you should be able to easily get through the day, but results may vary based on network conditions and daily usage. We recommend to charge your phone at night or during periods of inactivity. We store your data safely on our servers. You can request a full copy of all your data within the app. We will delete all your account and all your data on request. How do you take a simple task—like walking 30 minutes a day—and make it truly compelling? Human does just that by polishing the cardio-based objective to a sheen—and then staying out of your way. From within your pocket or bag, Human tracks your daily-move goal, only alerting you when you need a few extra steps or when you’ve made your goal. Hitting streaks unlocks gorgeous new backgrounds, and the longer your streak, the more alluring the scenes. Obviously I was an early adopter. I stuck with them when they essentially eliminated the option to prioritize accuracy for battery life, meticulously correcting dozens of segments in my cycling rides. How the algorithm thinks that in an hour you can spend five minutes alternating between transport and cycling I may never understand... But now I can't even edit. Crashes every time I go to the timeline. I'm not premium. $3/month is too much and I thought there should have been an option for the early community to buy in old style and just pay for the app. So maybe I'm part of the problem but they no longer answer feedback like they did in the beginning. I suspect it's now abandonware. Sad, really. I wish I could afford to support more developers but with everyone asking for $3-5/month it's impossible. I've been using this app for over 3 years now (July 2014). From the beginning it was an awesome idea. Intuitive, easy to use, knew exactly what mode I was in with astonishing accuracy. However in the past 6 months or so it has been downhill. The tracking is less accurate or occasionally missing. I found the most useful feature to be the data export, where you could download millions of pings of data at once and run your own analysis. Now they have not only removed this feature, but the support account was unresponsive and dismissive when I tried to get months of data that was not showing up in the export. In summary, I love the idea of this app but it's probably best to search for an alternative that the developers have not abandoned.